The purpose of the Inyo-Mono Integrated Regional Water Management Plan (IRWMP) is to foster coordination, collaboration, and communication among water-related stakeholders in the region for the purpose of developing water management strategies and projects that will benefit multiple entities and enhance water supply, water quality, and watershed health. The Inyo-Mono IRWMP was conceived in early 2008. The Inyo-Mono Regional Water Management Group (RWMG) submitted a Region Acceptance Process application to DWR in April, 2009, and was unconditionally approved as a region in November, 2009. The Inyo-Mono RWMG's mission is to research, identify, prioritize, and act on regional water issues, and related social and economic issues, so as to protect and enhance our environment and economy. To learn more about the Inyo-Mono IRWM and the Inyo-Mono IRWMP, please visit the Inyo-Mono IRWM website here. Completing disadvantaged communities grant, including producing a documentary about Disadvantaged Communities in the Inyo-Mono region. Located east of the Sierra Nevada range, the Inyo-Mono IRWM region is uniquely isolated from the population, economic activity, politics, and even precipitation of much of California. The region is characterized by very low population density compared to most of the state and vast open spaces. The region is predominantly arid, but for the steep mountain front immediately east of the Sierra Nevada crest, with some portions classified as hyper-arid. However, snowmelt runoff flows into some parts of the region, despite minimal direct precipitation. Three large regional rivers export a great deal of water to Nevada and southern California. Consequently, limited water supplies as well as a low proportion of private land ownership have constrained local land use and human settlement. Limited economic opportunities, particularly in tribal communities, further compound the difficulties of building and operating residential water delivery systems. Towns and communities of the region were established either where water was readily available or where some other exploitable resource outweighed water supply concerns. Geographic diversity astutely describes the Inyo-Mono IRWM planning region, which covers a large area of the central Californian Great Basin. The area includes the topographically highest and lowest points of California (and the contiguous United States), places with the highest summer temperatures in the country (Death Valley) and occasionally the lowest winter temperatures in the country (Bodie), deep winter snowpacks along the Sierra Nevada crest, and entire years without rainfall in some of the desert portions. These extremes are within a couple of hundred miles of each other. The Inyo-Mono IRWM region consists of several large watersheds with internal drainage and no natural outlet to an ocean. The principal river basins or watersheds of the planning area include (from north to south): West Walker River, East Walker River, Mono Basin, Owens River, Amargosa River and Death Valley, Panamint Valley, and Indian Wells Valley. Several other closed basins are included in the southern portion of the planning area. The vast area of the Inyo-Mono planning region (about 11 percent of California’s total area) seemed appropriate when initially determining the extent of the region. Besides the geographic position as the western portion of the Great Basin, the region’s residents have long self-identified their home as “the eastern Sierra” or “eastern California”. Because of their common geographic isolation away from the larger cities and urban areas of California, Mono and Inyo Counties have developed a regional identity. This “eastern Sierra Nevada” region is well established in a variety of matters such as economic interdependencies, logistics for regional transportation, practicalities for recreation, marketing for tourism, public lands administration, and export of water. In addition, hydrologic boundaries were an obvious determining factor for including the principal watersheds that drain the east side of the Sierra Nevada south of the Carson River basin (which was previously included in the Tahoe-Sierra planning region). The geographical extent of Inyo County into the northern Mojave Desert led to inclusion of several large closed basins wholly or partially within Inyo County. In turn, the watershed boundaries of those basins required including small portions of Kern and San Bernadino counties. The hydrologic linkages and similar water issues throughout the region enable many opportunities for integrated approaches to water resources management. Indeed, we are learning that what DWR has termed the “maximum opportunity for integration” may occur at the level of county government. Both Inyo and Mono Counties may hold the key to facilitating technical, managerial, and financial assistance to the economically disadvantaged as well as tiny communities throughout the planning region. Boundaries of the Inyo-Mono IRWM planning region enclose Inyo and Mono Counties, northern portions of San Bernardino County and the northeastern corner of Kern County. In the northwest, the region boundary follows the divide between Alpine and Mono county jurisdictions. On the western edge, the boundary follows the crest of the Sierra Nevada and jurisdictional borders of Mono and Inyo Counties with Tuolumne, Mariposa, Madera, Fresno, Tulare and Kern counties. The southwestern boundary also follows the crest of the Sierra Nevada in Inyo County plus a small portion of Kern County. To the south and southeast, the region follows watershed boundaries that share more common water resource issues with Inyo County than with other watersheds in Kern and San Bernardino counties. These watersheds include Indian Wells, Searles, Upper Amargosa, Death Valley/Lower Amargosa, Pahrump-Ivanpah, and Panamint Valleys. The east side of the planning area follows the California-Nevada state line. The Nevada side of the watersheds shared by California and Nevada is recognized as an area sharing water resources issues with the Inyo-Mono IRWM planning region and is included in the Inyo-Mono IRWM planning area as an “Area of Interest.” Thus, within California, except for the southern boundary where watersheds extend into Kern and San Bernardino Counties, the Inyo-Mono IRWM planning region boundaries are delineated by both watershed and jurisdictional lines. Inyo County, which makes up most of the Inyo-Mono planning region, is the second largest county in California in total area (10,140 square miles) but has a comparatively small population of about 18,550. Mono County covers approximately 3,100 square miles and has a population of about 14,200 (2010 Census). The region is generally rural and sparsely settled with residents concentrated in and around communities such as Bishop, Ridgecrest, Independence, Big Pine, Lone Pine, Bridgeport, June Lake, and Mammoth Lakes. Inyo-Mono IRWM region is comprised of 12-18 large hydrographic units or major watersheds. Numerous groundwater basins underlie the region. Major drainage systems in the region are the Walker, Owens, and Amargosa river systems. The Walker River system flows from the eastern slope of the Sierra Nevada into Nevada where it terminates at Walker Lake. Prior to the construction of the Los Angeles Aqueduct, the Owens River historically terminated at Owens Lake; presently, the Los Angeles Aqueduct is the sole means by which runoff from the region can drain to the Pacific Ocean. The headwaters of the Amargosa River are in Nevada, from which it flows into California, terminating in Death Valley. Numerous other internally drained basins exist wholly or mostly within the region, including Mono, Saline, Eureka, Deep Springs, Indian Wells, Panamint, and Searles Valleys. Naturally occurring perennial lakes are uncommon except at high elevations in the Sierra Nevada and in the adjacent valleys receiving runoff from the eastern slope of the Sierra Nevada. The largest natural lake in the region is Mono Lake. The Inyo-Mono IRWM planning region not only reflects watershed boundaries but areas of common water management history and interest as well. All the water in the western portion of our region, east of the Sierra Nevada crest, flows east into water bodies that are important for fisheries, stream habitat, recreation, and water supply for communities in Nevada, southern California, and the planning region itself. The watersheds in the south of the planning region share common issues such as low population density, rural water management, large tracts of federal land, an arid climate, and complex topography. One of the larger hydrographic units in the planning region, the Owens river, spans two counties and provides water to the Los Angeles Aqueduct (LAA) and the four million residents of Los Angeles. Several IRWM planning groups adjoin (or nearly adjoin) the Inyo-Mono region on the west side of the crest of the Sierra Nevada (north to south: Stanislaus–Tuolumne, Yosemite-Mariposa, Madera, Southern Sierra, and Kern County). The Tahoe-Sierra IRWM planning region meets the northern extent of the Inyo–Mono region along the watershed divide between the Carson and Walker river basins. 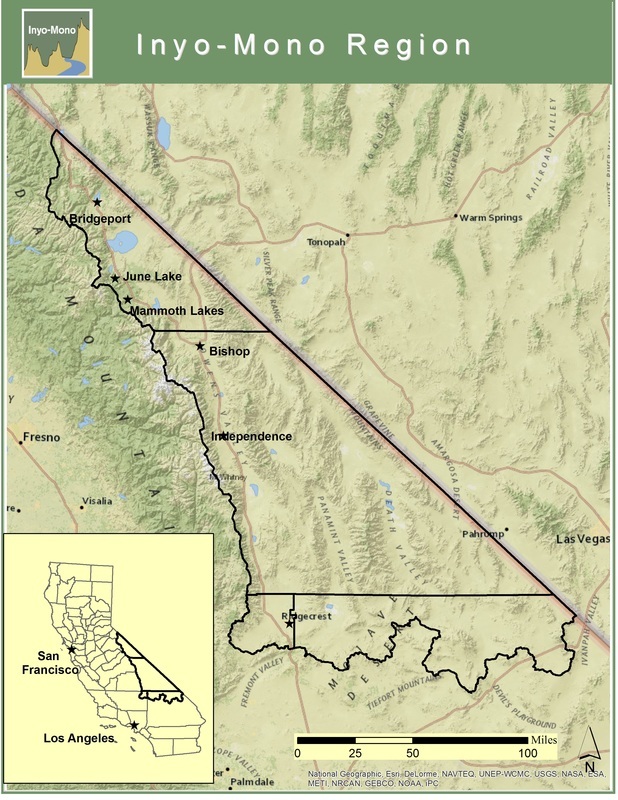 The Mokelumne–Amador–Calaveras IRWM planning region does not share a boundary with the Inyo–Mono IRWM region, but it is close to the northern part of our region. The Mojave IRWM planning region and Inyo–Mono IRWM region share a portion of the Indian Wells–Searles basin within northern San Bernardino County. The Antelope Valley IRWM planning region is within 20 miles of the southern extent of the Inyo–Mono IRWM region in Kern County. The Fremont Basin IRWM planning region was recently formed and shares part of the southern border of the Inyo-Mono planning region.